Twenty-two year old Dwayne Christiani, a driver at Tower Suites, was Friday morning charged and placed before the courts for causing death by dangerous driving. 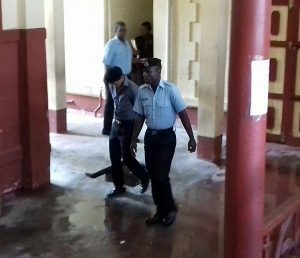 Christiani appeared before Chief Magistrate Ann McLennan where the charge read that on April 22 at Eccles Public Road, East Bank Demerara he drove motor car PRR 2605 in a manner dangerous to the public thereby causing the death of William Stanford. To the charge Christiani pleaded not guilty. Police Prosecutor Alwyn Moore did not object to bail but asked that substantial bail be granted under the condition that he reports to the Providence Police Station every Friday until the completion of trial. As such Chief Magistrate McLennan granted bail in the sum of GYD$400,000 and ordered that he reports to the Providence Police Station.